Desert Hydrology Manual for Improved Highway Design Methods (CA) | WEST Consultants, Inc.
Caltrans commissioned this study to satisfy the need for hydrologic methods that reflect the unique properties of California’s desert storms. California’s desert areas were divided into six regions based on similar geographic, climatic, and hydrologic characteristics: Colorado Desert, Sonoran Desert, Antelope Valley, Mojave Desert, Owens Valley/Mono Lake, and the Northern Basin and Range. A suite of hydrologic methods was analyzed, including flood-frequency analysis, regional regression equations, and rainfall-runoff simulation. The current regional regression equations in USGS Water-Supply Paper 2433 and Water-Resources Investigations 77-21 were found to not adequately represent the watershed conditions in California’s deserts. 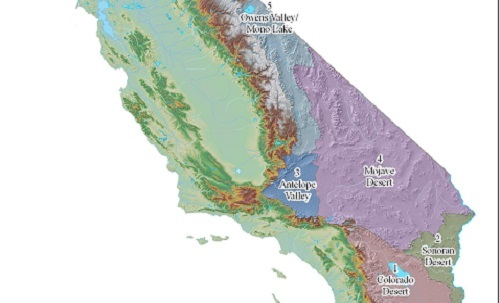 For this reason, the data set that was used to develop the USGS regression equations was reduced to a subset such that all selected stations have watershed characteristics similar to California’s desert regions. New regression equations were developed using this subset of data, with the addition of peak flow events that have occurred since the USGS reports were published. The new regression equations were found to produce better flow estimates than the equations found in the USGS publications based on the computed root-mean-square error (RMSE). Rainfall-runoff simulation was performed for one or more test watersheds in each of the desert regions. Recommendations for desert hydrology, including those for flood-frequency analysis, regional regression, and rainfall-runoff simulation, were summarized in a detailed hydrology flowchart. Finally, sediment/debris bulking methods were analyzed and a flow chart was developed that outlines the recommended bulking factor selection process for California’s desert regions. WEST coordinated with Caltrans HQ, a number of Caltrans districts, and multiple governmental agencies for this applied research study.